First of all, why did Jesus speak in parables like this? There are several reasons. 1. It was predicted that he would. Jesus spoke all these things to the crowd in parables; he did not say anything to them without using a parable. So was fulfilled what was spoken through the prophet [Asaph, a Levite, whose job it was to teach in the court of King David]: “I will open my mouth in parables, I will utter things hidden since the creation of the world” (Matthew 13:34-35). 2. Parables engage the listener, makes them curious, think and work at it, to arrive at its meaning. Once the lesson is clear, it is more deeply remembered than if taught in a direct manner. 3. The followers of Jesus often included those in the Sanhedrin, who were always looking for some way to trap Jesus. By using parables, he could be talking about them and they didn’t have a clue! God hides the truth from those who hearts aren’t open to hearing it. Secondly, why is Jesus comparing people to salt? The word “salt” in Greek is ἅλας and transliterated is “halas.” Looking at where else this word is used in the Bible, I found these verses. Salt makes food more palatable, and here Job is having to live through very difficult experiences (“that which is unsavory”) without anything to make him feel better about what is happening to his life (“salt”), not even his friends who were judging him harshly. If you are a Christian, do you make God’s word “taste good” for others in love, or are you like Job’s friends who were using scripture to condemn Job? Be wise in the way you act toward outsiders; make the most of every opportunity. Let your conversation be always full of grace, seasoned with salt, so that you may know how to answer everyone (Colossians 4:5-6). God says to be wise when dealing with people who are outside the grace of God, that grace and mercy be on our lips, to season our words with salt; again, so that our words are palatable by others. The world judges Christianity by what it sees in his followers, and bigotry especially has turned an entire generation of young people against the word of God. Everyone will be salted with fire (Mark 9:49). When we accept Jesus, we receive the baptism of fire with the Holy Spirit. He enters into us to reconnect us with God. To be “salted with fire” alludes to the relationship that we gain with God from the Holy Spirit, who teaches us in our spirits and makes us salt among people. The Holy Spirit is our proof that God is real and Jesus is who he said he is. We have to believe and then we gain our proof with the Holy Spirit, not, we get proof to believe. God created a “covenant of salt” with his people. And God required that they use salt in their grain offerings. Salt here is symbolic of the relationship that God wants to have with us. Salt is a time proven preservative that prevents decay and corruption, and was used in place of the refrigerator to keep meats and grains from rotting. Salt stands for preservation, eternal, stability, and permanence, which is the character of God. It represents that our commitment to God is just as eternal and permanent. Being salt in the world also means that our relationships with others should be preserving and healing to their spirits, permanent, with unwavering commitments. Too often people are fair-weather friends, have fair-weather marriages, or turn their backs on God, and the impact that has upon lives is devastating. 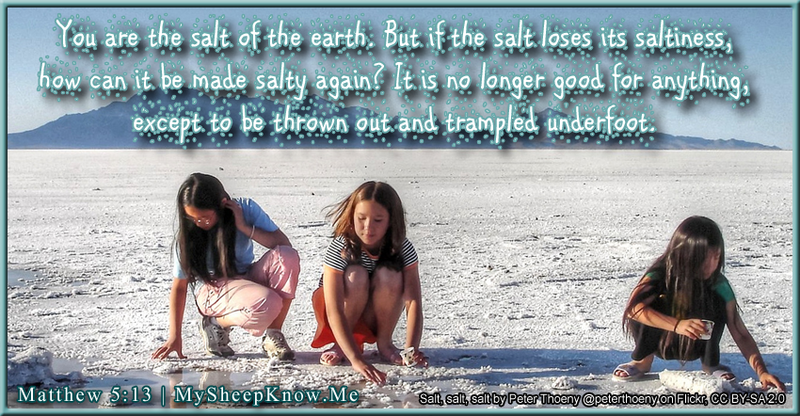 Then the “salt loses its saltiness” and God says they are no longer good for his kingdom and will be “thrown out and trampled underfoot” come judgment day.